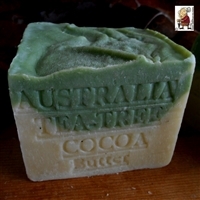 We are told that in 1732, Tea Tree Oil first came to the attention of western society when Captain James Cook landed in Australia. He brewed a spicy and refreshing tea from the leaves of the Melaleuca Alternifolia tree thus naming it the "Tea Tree." Captain Cook met with the Aborigines and they shared their healing methods using this tree. Later, James Cook had a doctor test it, who confirmed its natural antiseptic power found in its leaves. Cook and his crew drank the tea to prevent scurvy. In 1920, Dr. RA Penefold, a government chemist in Sydney, Australia, was credited for beginning the human clinical research of the many benefits associated with Tea Tree Oil. His studies determined that Tea Tree Oil had a Rideal-Walker co-efficient of between 11 and 13. This means the oil is 11 to 13 times more powerful than carbolic acid (phenol) for killing bacteria and fungi yet non-caustic to the skin. In 1930, Mr. EM Humphrey identified that Tea Tree Oil's disinfectant action on the typhoid bacilli was sixty times greater than that of ordinary hand soap. During World War II, the Australian army and navy incorporated Tea Tree Oil in first aid kits as an official germicide. Tea tree oil is distilled from the leaves of an Australian plant known as Melaleuca alternifolia. Tea tree oil is an essential oil that has both cosmetic and medicinal treatment properties. Some of the most common tea tree oil uses are in shampoos, lotions, mouthwashes, and gels. Pure tea tree oil is available online and in stores that sell health-related products, though it is normally diluted before use. Those who apply tea tree oil for acne treatments often see a dramatic improvement in their skin. Tea Tree oil is a very powerful immune stimulant, helping to fight infections and promote clear skin. Its scent is described as fresh, warm, spicy, medicinal and pungent. Tea Tree Oil is a natural antiseptic, bactericide, fungicide and anti-viral with anesthetic qualities. Unlike most other antiseptic preparations, Tea Tree Oil can be used daily without causing an imbalance in the natural bacterial flora on the skin. It has been used by the Australian Aborigines since the beginning of time for acne, oily skin, rashes, various infections, fungal diseases, dandruff, and itchy scalp. In World War II Tea Tree oil was issued to each soldier and sailor as part of their field kit to treat tropical infections and infected wounds.